There are many people who take part in many pointless discussions in the world. Some say needless things to each other jokingly which lead to arguments and discord. Speaking without thinking, needless, pointless things that serve no beneficial purpose and lead only to difficulties and strife. The Holy Qur’an prohibits believers from engaging in such things as serve no purpose and of no benefit. Hazrat Musleh Maud (ra) mentions in this regard an example that the Promised Messiah (as) used to give. The characteristic of a believer is to bypass pointless discussions without paying attention. The example is given of a woman. That she always is given to such pointless purposeless things, but these days it appears that men also to be found in the same state. For example women inquire about how much certain items cost or where they were prepared from and these are all examples of such useless and pointless talk that are purely worldly discussions that have no beneficial purpose and indeed sometimes can have detrimental impact on the ladies sitting nearby. He says till the woman obtains the whole history of the item she can find no contentment. The Promised Messiah (as) used to recount that a woman had a very beautiful golden ring made but no one paid any attention to it. She became so furious that she set her home on fire and when the people came to ask if anything was salvaged, she said nothing except this ring. A lady came and asked her when had she gotten this ring made, it is indeed very beautiful. The woman said to her had you asked this question earlier what need would there have been for my house to have been set alight. Hazrat Musleh Maud (ra) is saying that this habit is not specific only to some women but that men suffer from it too. After exchange of salutations, they start inquiring where have you come from where are you going and how much do you earn. Why is this needed? Then giving the example of the western nations, he says we never see one inquiring about salary or education or job status of another. Pointless things are not just those that can lead to harm, anything that has no benefit also falls under the category of things that we should avoid. The Promised Messiah defines such things as being those that produce no harm or benefit. These are the pointless things that a believer is told to avoid. A condition for a believer is that all of their discussions should be purposeful and he should avoid every type of pointless and non-beneficial thing. But if we carry out a survey we will find that a lot of people are indulging in such pointless talk. The Promised Messiah (as) used to narrate the following story that once a lowly individual was walking around in Lahore and he found a group of individuals engaged in a hue and cry. Upon inquiry, he found out that this was all due to the passing away of King Ranjit Singh. Albeit there were some kings who were oppressive but Ranjit Singh was responsible for establishment of peace. He was peaceful with Muslims to an extent as well. Muslims also served under him. Promised Messiah (as) father also served in a high capacity under his rule. The individual inquired why are people so restless upon his death? He said that even my own father had passed away so where does Maharaja Ranjit Singh figure into things. The lesson that the Promised Messiah used to draw was that those things that are dear to a person are what appear great in their eyes. Albeit Ranjit Singh influenced thousands, this man didn’t care because to him his father who used to lavish care upon him was the one who was important. Even some minor items may seem grand to us due to our need for them but due to lack of our knowledge, we consider great things minor. Even if a child is presented with an expensive diamond, will he really care? We should focus upon respecting our society as a whole, not just within our limited sphere. When an Ahmadi does good in the society it results not only in just his reputation but also of the Jama’at. And thus avenues of propagation are made apparent if we expand our sphere of compassion. The world will come to realize that it is only the true teachings of Islam which can result in true peace. Some make small sacrifices and think they have done a great deal or think they have done a great favour. The Promised Messiah (as) used to mention an incident in regard to such people. It is said that an individual hosted someone. He went above and beyond in hospitality. At the end, when the guest was about to leave he was apologetic to him that due to his wife being ill and other circumstances I was not able fully to pay the dues of hospitality. I hope you will forgive these shortcomings. The guest said I know that by saying this you want me to praise you but you should be grateful to me. The host said that was not my intention at all. The guest said I am fully aware of your intentions. The guest said that look you should realize that I could have set your home on fire whilst you were preparing food. The fact that I did not do so, is this not a great favour? You should be grateful to me. The host thanked him for not setting his home on fire. A believer should be grateful to others instead of seeking thanks from others. Once a king who was very much inclined towards and impressed with a PEER [spiritual guide] and always used to say to one of his viziers that he must go and meet him. But because the Vizier knew the reality about the Peer he always would somehow avoid going. But once when the King went to the PEER he took his Vizier with him. The Peer made some totally erroneous reference to history and the Vizier made a remark noting the utter ignorance displayed by this and the King lost all respect for the Peer. The Promised Messiah used to mention this and then say that one should be mindful and knowledgeable of their surroundings. It is important to understand the traditions and practices of where an individual is going. Nowadays our missionaries are questioned about the state of the world. All missionaries should keep themselves abreast of knowledge of history, geography, medicine, manners related to speech, and gatherings – at least to the degree necessary to be able to join gatherings of respected people. This is not at all difficult to achieve. All that is required is a little effort. So elementary books of these fields of knowledge should be read. Apart from this also sometimes when our missionaries are asked about current affairs they are not able to respond adequately as they are not keeping up with the knowledge of what is going on in the world or have not delved into these matters in any depth. Under such circumstances sometimes worldly people go away with a bad impression and sometimes complaints are received. Promised Messiah (as) remarked that an individual had two sons. He distributed his wealth amongst them. The younger son took his wealth and went far away and wasted his wealth. When he lost everything he ended up being a common labourer. But seeing that he was not able to even feed himself despite working and that his father employed many such servants who were able to take care of themselves, he decided to go his own father and ask for such employment. The father happily accommodated him and celebrated the son’s return by having an animal slaughtered in honour of his return and the consequent happiness. When the other son arrived, he did not like the fact that the younger son’s return was being celebrated in this way – he who had wasted his fortune. He told his father that he had always obeyed him and yet had never been so well treated as his brother. The father remarked that you were always here with me and all that I have is indeed yours but all this happiness is being celebrated because my son was lost and all but dead but now we have found him and he has come back to life. When an individual admits their flaws in front of their God, God turns to them with Mercy and accepts their repentance. So learn to forgive your brothers who come to you with pure hearts admitting their shortcomings. Also pray for those who are not seeking forgiveness. One should strengthen their personality and should not be detracted. The Promised Messiah used to relate a story. A king liked eating eggplant. When his servant learnt this he started praising the attributes of an eggplant a lot. After a few days the king became sick and said that he did not like eggplants. Upon hearing this the same servant started to say bad things about eggplants. An individual who saw him do this said that only a few days ago you were praising the eggplant and now you are saying such bad things about it. The servant remarked that, look, I am a servant of the king not of the eggplant. This is the character we see displayed by the Muslims today. Muslims should display the most robust character and actions but we witness they are the most defamed. There is no question of them being established on the truth. Wherever Muslims see even an iota of benefit, they turn towards that direction. The leaders and the citizens are alike. Forming a relationship with Allah makes one resolve their affairs. This relationship only increases with righteousness. 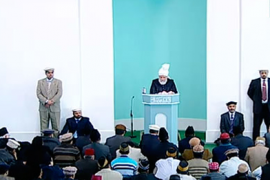 We Ahmadis who claim that we have accepted the Messiah (as) have to adopt teachings of Islam & reform their lives. We have to form a bond with God and live our lives accordingly. If we are righteous and have fear of God, only then can we witness success. Angels will help us Insha’Allah. All of us need to think about how to establish righteousness and form a bond with God. When a worldly individual can benefit by his worldly relationship with a worldly person then the relationship with the Divine can help us thousand – 100 thousand fold more than this. An individual was going on a journey and left some money with another. Upon his return, the individual said no such money was left with him. Ultimately the individual complained to the King and the King decided to help him and told him to follow a set of steps that would make this individual think that he has good connection with the king. The king started having a lengthy discussion with the individual. When the man who had been entrusted with the money saw this he decided to return the money. Why should we worry about opposition of the world? We should focus upon developing our love with God. True success is to leave yourself at the threshold of the Divine. A true believer is akin to a truthful friend. Once a father remarked to his son that none of your friends are truthful. They are here to take advantage of you. The father said I have only found one truthful friend throughout my life. The father wanted the son to test his friends. When the friends realized the son is no longer being supported by his father they distanced themselves from him and abandoned him. The son approached his friends and none wanted to meet him. The son told his father all of them were disloyal. The father said now I will introduce you to my friend. He arrived at his friends house in the dead of night and knocked on his door. But the friend did not come for a long time and the son thought that his father’s friend also was the same. But after a long time the father’s friend came and when he did he explained the delay was due to him thinking that he may need to help his friend and so he came with a sword, a bag of money, and his wife so as to be able to offer him whatever assistance he may be in need of. He brought a sword in case his friend was in danger. He brought the sum of money to financially assist him. He brought his wife in case his friend was sick. The father remarked I mean no trouble. I am only here to teach my son a lesson. This was example of a good friendship. Our friendship with God should be far greater. Believers should pray to God sincerely. God has made many items for our comforts. God fulfills our wishes without measure and if he does not fulfill a single wish, we become dismayed. Those who do not pay dues of worship, should evaluate themselves. Those who fail to give precedence to faith should evaluate themselves. Those who have come to western nations for sake of Ahmadiyyat but have not paid dues should evaluate themselves. We should prepare ourselves for sacrifices for the sake of God. Wherever true love exists, rationale is not sought. When we makes claims of obedience, they do not seek clarification. When God reveals, true believers willingly accept and make plans how to accomplish God’s plans. God awoke Holy Prophet (sa) for guidance of humanity and he made plans how to accomplish his goals. Now it has been 126-127 years since the New Era began. How many of us truly ponder over why we were given this happiness? Many awaited for the Messiah and passed away. This day of success and happiness was given because God raised an individual for sake of mankind. Crying and laughing is outside the characteristics of God but in matter of great love, He can display his emotions. If God could laugh, he would laugh at how an individual has stood up to face the world. God would have cried if He could upon seeing a person deeply in love with Him. The example of friendship is nothing compared to the friendship of Prophets with God. Prophets relation with God is of a much higher degree. In matters of love, the poor friend came out with a sword, wealth, and his wife to assist his friend. When one is truly in love, one’s senses are left aside. When one is worried, senses are left aside. The reality is that passion and love is truthful. When Messengers are revealed to by God, that God who looks upon the entire world, asks his Messenger to help. The Messenger does not say how can I help you when you are the guardian of all universes? The Messenger says Here I am, Here I am, Here I am. 126 years ago today, that God raised His voice and called upon an individual in Qadian who was in seclusion. That God said world has defamed me. I am helpless, O my Creation, Help me! That individual did not think that God is all-powerful. How can I truly help Him? When we claim to be in the fold of the most ardent devotee of our beloved Prophet (sa), when we believe Islam has entered it’s era of renaissance and will reach corners of the world. If we have entered his fold to be helpers of the Messiah (as), then we should says Lab-baik and present ourselves.